Here’s the recipe for the Skinny Pigs in a Blanket I mentioned in my easy healthy broccoli slaw post. I made these Skinny Pigs in a Blanket with just 3 ingredients: 97% fat-free Hebrew National hot dogs, a package of refrigerated Pillsbury Simply Buttermilk Biscuits and sesame seeds. If you have been on Weight Watchers for a while, you’ve probably heard about Hebrew National’s 97% fat-free franks. They have just 40 calories and *1 WW SmartPoint (compared to *5 or more Points in most hotdogs.) And I think they taste great. Have you tried Pillsbury’s line of “Simply…” products? They are not necessarily “light.” But they do have less junk in them. The Simply…®Buttermilk Biscuits contain zero grams trans fat, no high fructose corn syrup and no artificial colors or flavors. Each biscuit has 100 calories, 4 g fat, 15 g carbs, 0 g fiber, 2 g protein and *4 Weight Watchers Freestyle SmartPoints. I flattened the biscuits into 4-inch round “blankets” to wrap around my hotdogs. I lightly misted the biscuit “blankets” with water and sprinkled on a few sesame seeds, which dressed them up a bit. But, this is totally optional. According to my calculations each Skinny Pigs in a blanket has 140 calories, 4 g fat, 18 g carbs, 0 g fiber, 8 g protein, *4 Weight Watchers PointsPlus, *75WW Freestyle SmartPoints. Enjoy! 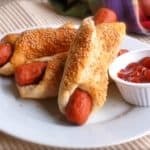 If you’ve made these Skinny Pigs in a Blanket, please give the recipe a star rating below and leave a comment letting me know how you liked them. Skinny Pigs in a blanket with just 140 calories and *5 WW Freestyle SmartPoints make for a tasty treat with a lot less guilt. Flatten biscuits into 4 inch circles. Wrap each hot dog in a flattened biscuit, pressing to seal the seam. Lightly mist with water. Sprinkle with sesame sees and press lightly into the biscuits, if desired. Bake at 375F degrees for 15 to 20 minutes, or until golden brown. 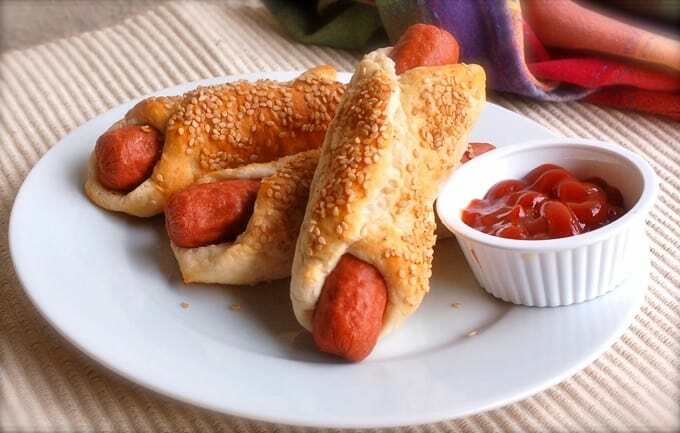 Enjoy your skinny pigs in a blanket with your favorite condiments. We like ketchup and yellow mustard.